State patrol and SOCF officials said they found these fake weapons stashed inside the Lucasville prison. A tip Wednesday from an Associated Press reporter led officials at the Southern Ohio Correctional Facility in Lucasville to the discovery of a fake explosive device, along with several fake guns in the cells of inmates. According to information released by the Ohio Department of Rehabilitation & Correction, the tip was phoned into the office of SOCF Warden Ronald Erdos. SOCF security conducted a search of certain areas of the prison apparently shortly after the tip was phoned in to the maximum-security prison. According to reports, “almost immediately” a fake explosive device was found concealed in a hole located in the frame of a shower stall. A further search was done initially of five inmate cells. In two of the cells, inmates were allegedly in possession of fake handguns that appeared to be Glock pistols. Prison officials instituted at least two emergency protocols and additional staff was recalled. 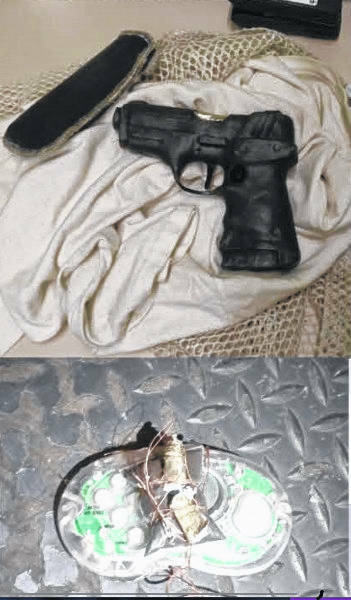 During an additional search, yet another complete fake handgun was discovered along with pieces to another bogus weapon which appeared to have been disassembled. 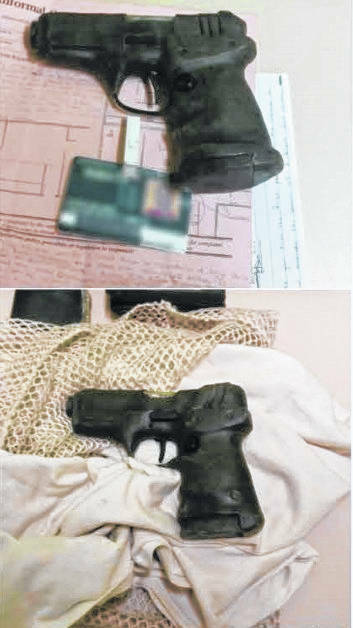 Further, several of what were described as contraband drawings of handguns were taken from the cells of inmates allegedly involved in the incident. The Ohio State Highway Patrol investigative unit responded to the prison and interviewed inmates. The OSHP reported the fake weapons were made of soap, pieces of eyeglasses, battery casings and carbon paper taken from legal kits. The fake explosive device was reportedly made of shavings from the grout in newly installed showers, copper wire from ear buds, batteries and a small transistor radio. The state patrol indicated in a phone call from the Daily Times, said no further information would be released beyond what was contained in the press release. That release gave no indication of what inmates might have intended to do with the bogus items or how many inmates were involved. The press release also did not discuss how the AP reporter came to know of whatever plot seemed to be in the making. https://www.portsmouth-dailytimes.com/wp-content/uploads/sites/28/2019/02/web1_Capture-1.jpgState patrol and SOCF officials said they found these fake weapons stashed inside the Lucasville prison. https://www.portsmouth-dailytimes.com/wp-content/uploads/sites/28/2019/02/web1_Capture-2.jpgState patrol and SOCF officials said they found these fake weapons stashed inside the Lucasville prison.